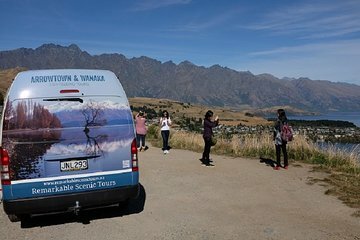 Scopri i punti salienti, la storia, la cultura e i paesaggi di Queenstown in questo tour di mezza giornata. Con un piccolo gruppo limitato a solo 11 persone o meno, puoi viaggiare in un minivan in locali come Crown Terrace Viewpoint, Shotover River, Lake Hayes, Arrowtown e altri. Pick-up e drop-off nel centro di Queenstown inclusi. This is short tour but gives you a good overview of Queenstown and surrounding areas. Our guide was informative and pleasant. We were the only 2 on the tour so it was very personalized! Good experience. Our tour guide was very friendly and informative but the tour could be bit longer, looked short compared to half day tour. This tour was truly good value for money. My mum and I were very happy with the tour and highly recommend it. If you want top notch views of Queenstown surrounds, our guide Wayne is the man! He had the best lookout points for amazing photos. One of the best things about small group tours is that the service is more personalized and it's more beneficial than big tour groups. Arrowtown, which capped the tour was a a bonus - a lovely town founded by the gold rush. We didn't have much time here but we enjoyed it and looked forward to spending more time here in the next group tour with the same company.